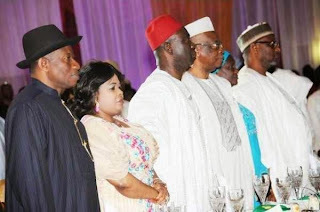 ABUJA (NAN) ― A total of N58.79 billion was realised at Thursday’s fund-raising dinner for President Goodluck Jonathan’s Victims Support Fund, his office disclosed in a statement on Friday in Abuja. The statement, issued by the President’s Special Adviser on Media and Publicity, Reuben Abati, said the sum exceeded the initial target of N50 billion by N8.79 billion. It expressed Jonathan’s appreciation to those who responded to his call for collective action to support victims of terrorism in the country, for which the fund is meant. “The President said he was overwhelmed by the expression of support, co-operation and solidarity by Nigerians and friends of Nigeria from all walks of life. “It shows that the public is genuinely concerned about the threat of terrorism to our common humanity and stands ready to support worthy causes and pro-people policies. “Jonathan notes that the overwhelming demonstration of support for the fund has greatly inspired the government to continue to adopt every possible measure to bring terrorism to an end in the country,’’ the statement said. It also conveyed Jonathan’s appreciation to the fund’s Chairman, Gen. Theophilus Danjuma, and members of the Victims’ Support Foundation for accepting to serve the nation in this regard. The statement expressed the President’s conviction that the Foundation would make judicious use of the fund to ameliorate the negative impact of terrorism in the affected areas. It also expressed Jonathan’s appeal to other Nigerians and friends of the country to make their token contributions to the fund as the foundation seeks further support.